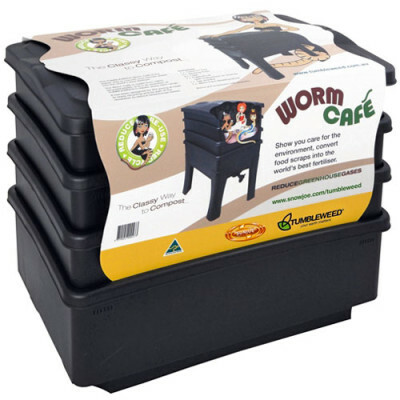 Tumbleweed’s Worm Café® is the ultimate worm farm for indoor or outdoor use. 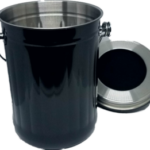 With a sleek new design and clever features, the Worm Café® turns organic waste into rich worm castings and worm tea with no mess. 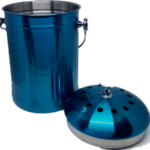 You’ll find your Worm Café® is easy to use in every way – a hinged lid helps you open and fill your worm farm while a sloping base on the collector tray assists the worm tea to drain easily from the drip free tap. The entire unit has been designed to prevent brown tea from running down the worm farm legs to stain your floor or tiles. Three working trays, all of which are side ventilated, maximize the Worm Café’s® environmental stability, and keep air flowing without allowing rain to fill the farm and drown your worms. Cross ventilation also helps to prevent worm tea from turning anaerobic. The Worm Café® has been designed with mounds on collector trays and a fly proof lid to encourage worms to continuously move up through the trays in search of fresh organic waste. 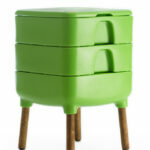 Modern legs with ant caps and a fly proof lid help prevent ants from climbing and insects from getting into your Worm Cafe®. For absolute convenience, instructions are engraved under the lid of the Worm Café®. This is our third version of worm composting, starting with homemade. We’ve definitely moved on up in the world to a high rise in the worm world! This is super sturdy and up high enough not to have to bend over. 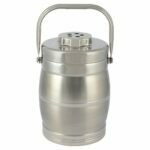 I am new to worm composting, in fact I am new to gardening. I purchased the worm café and 2000 composting worms. They shipped on Monday, I received them on Friday. They were shipped in the same box, a soft bag of worms and a hard plastic worm café. When I opened the box, I didn't know what to expect, but the stink of dead worms, not fun. They had gotten smashed between the worm café and the box that carried them both together. I sent an email and was pleasantly surprised to hear back from someone right away. They had apologized and submitted a reorder to be sent out on the following Monday. I received a bag of happy and very alive worms on Wednesday. I am pleased to announce that...(with the exception of my very first night with my new little helpers, where I placing their nicely blended fresh organic safely kept in the refrigerator food until they safely arrived... apparently worms do not like cold food, no matter how fresh and wonderful it may be, it was quit the scene! We managed to round up most of them in the dark.) ...that they are now happy and healthy and warm in my garage (because it is really cold right now) thriving and I have now watched a dozen videos on how to care for my worm café to ensure that I do not do anything silly like that again. I'm just getting started but after 3 weeks they are very happy with their new home. I'll be back in the future.